NOTE: Macrobiotic. 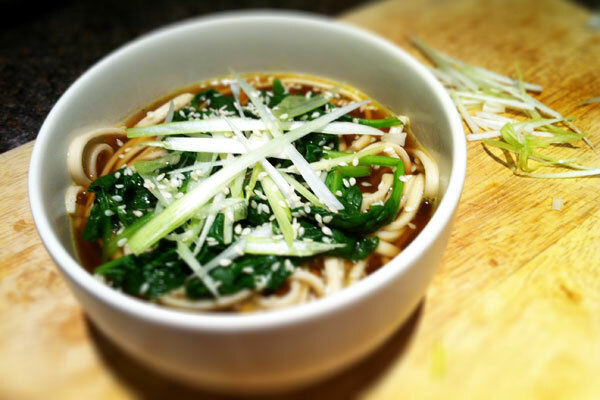 A noodle soup with a light broth base, perfect for lunchtime or with added tofu pieces for a more substantial evening dish. You can leave the Bonito flakes out if you are not keen on fishy flavours. Pre-cook udon noodles in salted boiling water until tender, about 5-7 minutes. Drain and rinse under cold water until cool. Meanwhile, place stock in a pot and bring to a simmer, add mirin, bring back to a simmer and cook for a further 3 minutes.